Juliette is a broken girl. She has been stripped away from her family, if you want to even call them that, and shut away in an asylum all because of her deadly touch. She has no idea why her touch can take a life or where this ability, slash curse, came from. All she knows is that she has spent the last 264 days alone in a cramped cell trying to convince herself that she isn't crazy. On day 265, she gets a cellmate. A male cellmate. She is convinced he is there to kill her - give her what she deserves - but he doesn't. Adam asks a lot of questions and seems to be genuinely interested in Juliette's story, but she has no intention of giving her secret away. There is something familiar about this boy and within a few days, he turns her world upside down. I so don't want to spoil this story for you. I went in totally blind and was slapped in the face with surprise after surprise. I loved this book so much that I want you to have that experience too! Don't be afraid of the science fiction feel of the synopsis (if that's not your thing), it doesn't creep up until the last half of the book and it isn't overwhelming. At all. This book has a little bit of everything; mystery, adventure, romance, and boys with big guns. It is also steameee! I love it when an author gives us a real look at teen romance. 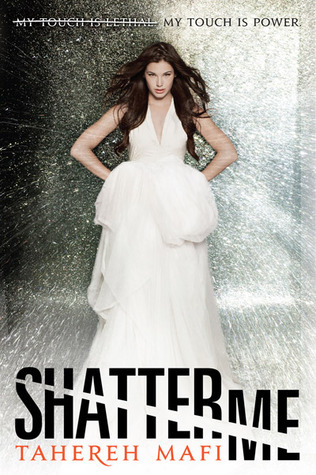 Sometimes it's hot and heavy and Shatter Me is all that and more. I was sweatin' some of those scenes. Whew! Mafi's writing style is, to put it simply, utterly beautiful. I was mesmerized at every word. On one page I want to cry for Juliette because of the hand she was dealt, and on the next I am in awe of her courage. Book two could go in a lot of different directions, and I'm pretty certain the best of Juliette is yet to come. Either way, this one scooches close to the top of 2011 for me.